The Continental Ultra Sport II comes in 700c x 23/25/28mm. Folding Bead. Black. tires & tubes are great, the grip is massive & I even have a little more confidence when riding in the rain. I love Contis so much I've begun stocking up on tubes & tires at bargain prices. Looking forward to using wider tires & a Gatorskin over the winter. I'm tired of buying expensive tires with that wear out quickly and get flats. These are always more durable. Good value, puncture resistant and easy rolling. I have 4 bikes and use these on all of them. They are affordable, reliable and long lasting. Actual Weight of 700c x 28 327 grams. Measured a brand new Super Sport II foldable on balance beam scale. Actual weight was 327 grams. Expect a little nominal variation, but this quite far from the 280 grams listed on on Bike Tires Direct website - a 47 gram difference per tire. Very nice ride and very high value, but exceptionally tight bead. So tight that there simply was not enough room to tuck my inner tube out of the way of being pinched at the end of the mount, which MUST be done with tire irons. I'm using pretty expensive latex tubes, so it felt risky. Very thankful I didn't rip the tube. A roadside tube change might be a little risky in that regard. Perhaps the bead loosens up with repeated stretching. I think the other reviewers have summed up my feelings pretty well. Writing this just to add yet another confirming witness that this is a decent all-around tire. It's definitely not as fast as a GP4k but then, it shouldn't be at the price you pay for these and furthermore, I want more durability in a tire I plan to beat up every day. That said, they are NOT slow. They roll best in their first 400mi of use and as my back tire has gotten more worn, it doesn't feel quite as lively. Still a good fast tire though. Stands up well to my trainer which munches tires pretty well. Not sure about other folks but mine were a tight fit on both Mavic wheelsets that I have. Can't beat the price- will definitely order more. I ordered two sets of these tires and put one set on my Pinarello and one on my Lynskey. I've only put in one ride on each bike...but the tires felt great. One ride was a hill ride and the other was pure speed. I like these tires. I'll see how they hold up after a few 100 miles...but thus far...excellent. I would definitely recommend these tires. In fact, I'm ordering a set for my EVO. 700x25- replaced yksions that came with my kysrium elites. About 100mi so far on urban roads i ride at lunch. Despite price tag of the yksions i am very impressed. Seem easily as fast. Puncture resistance is always subjective but so far no nicks or cuts. Ride is smooth, gp4k-like. If i had no time to switch out tires or wheels, i wouldn't feel like i was making a major compromise competing on these. No wet weather experience but dry grip is good- smooth transition off the center tread into corners entices you to push in further. Better than the yksions. Mounting? Well they are a very tight fit. I rode these tires an average of 200 miles per week for a total of 3000 miles without a flat. Best tires I've ridden in the last 10,000 miles. Best all around training tire. Period. I have been riding and racing for 4 decades. I have used nearly every model of every major brand of tire. Clinchers and tubulars. Contis roll and wear the best. This tire is by far the best bang for the buck for everyday use. 180tpi for 20 something dollars. No brainer. For all out racing go for the Contis high end tires. so these tires grip well, wear well, which is the only reason they don't get a worse review, however... they are stiff as a board to get on and off the rim. Changing a tube if you get a flat is such a pain. My new Gator Hardshell tires are so much easier to get on and off. I know this because I mounted one with the rotation direction going the wrong way, and it only took me a few more minutes to switch it back. Tough to beat these all around tires smooth ride, durable. Some find Conti's hard to install, but I've always found them easy if I take my time. Purchased 4 Continental Ultra Sport II (Folding) Nov 2015, 2 have split along the bead. Two are on the bike now, waiting to see if they will last. Calling exchange or refund, hope this is just a bad batch. The wire bead tire would last a year or more, tried to upgrade at the new low price. Tough, long lasting tire with a great ride at a great price. I'm a fairly serious cyclist and a triathlete. I bought a set of these for training tires on my tri bike. I've been riding Conti Grand Prix's on my road bikes and thought I might try a cheaper tire for lots of training miles. The tires ride great. They are incredibly durable (no visible wear in 500 miles, I may need to cut off the little nibs because I can't seem to wear them off). They roll remarkably easy. For the price they are pretty incredible. However, that incredibly hard wearing rubber doesn't inspire the same confidence that the Grand Prix's do. I haven't really had any trouble, but I don't want to push them into the corners. Probably a great tire for riders who put in lots of training miles. I'll go ahead and pay the extra for the Grand Prix's. Just purchased the 25's and so far so good. 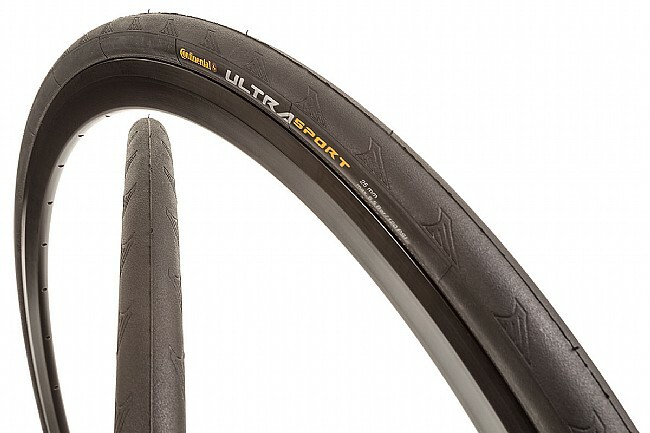 The Ultra Sport II are ridiculously inexpensive for the quality of the tire. I had some concern for the speed of the tire as they are a little heavier, but no problem, plus they handle well. Not as sticky as 4000's, but secure through hard turns. Too early to speak about durability at only 200 miles, although I've never had flatting problems with any Continental tire at any price point. As a cat 1 racer doing about 10,000 miles a year, I blow through tires. Since I race on tubulars, I'm usually only concerned about getting a cheap training tire that gets me a ton of mileage and won't break the bank. I've never cared about ride quality...until I bought these. When I saw the price of these tires and the TPI, I didn't really believe it, so I bought 5 from Biketiresdirect. Most training tires in this price range that I typically buy have a tpi around 30-70 and these are 180! You WILL notice that ride quality difference! I've pushed some of these tires to about 2000 miles (and other training tires to even more...until they are square) to get to the wear indicators but was getting too many flats. So you may not get down to the wear indicators if you ride on roads with as much debris as I do. So just change them a bit sooner. This is by far the best training tires I've ever ridden. I purchased the tires for my training bike and have put around 500 miles on them so far. I've used Continental tires in the past so I decided to try this less expensive version. The tires roll well,are confidence inspiring in the corners, and give a good feel of the road. They have been rock solid so far and I've not had a single flat. Low resistance and good adhesion. A joy to ride on these tires.